Terror waits for you in ThE House that Dripped Blood. It was written by the author of "Psycho" and features the top stars of today's best cinematic horror films. Heading...or be-heading the cast are such horror film all-stars as Christopher Lee and Peter Cushing, joined by Nyree Dawn Porter, an Emmy Award winner for her role in "The Forsyte Saga," Denhoim Elliott, and Ingrid Pitt. The strange house, its weird inhabitants, and their strange disappearances lead to a mystery filled with horror, shock, surprise and suspense. Vampires and witches meet masters of voodoo and psychological terror. The producers Max Rosenberg and Milton Subotsky, Peter Duffel, the director, and screenwriter Robert Bloch dare audiences to enter ThE House that Dripped Blood. The film, in color, is distributed by Cinerama Releasing. One week after renting a house in the country, film star Paul Henderson, (Jon Pertwee) disappears. Called in to investigate, Detective-Inspector Holloway (John Bennett) finds the house has a strange record of tragic tenancy. (Denhoim Elliott) and his wife Alice (Joanna Dunham) rented it years before. There Charles created a new villain, Dominick (Tom Adams), an insane strangler who roams the countryside looking for victims. As Charles becomes more obsessed by his writing, Dominick seems to become real to him. Alice persuades him to see a psychiatrist, Dr. Andrews (Robert Lang). But Charles' hallucinations continue until he thinks he sees Dominick strangling his wife, only to discover he has been strangling her. Charles rushes for help to Dr. Andrews. Is the distorted face of Dr. Andrews, dead in his office from strangulation, the work of Dominick or Charles? The truth is even stranger than Charles' fiction! After the Hillyers a retired stockbroker, Philip Grayson (Peter Gushing), a quiet and lonely man moves in. Visiting a wax museum, he is fascinated by the figure of Salome bearing the head of John the Baptist. Her face looks like a woman once loved by both Philip and his best friend. He and his friend Rogers (Joss Ackland) fall under Salome's spell. The proprietor explains that Salome was modelled on his dead wife, after she had paid the final penalty for murdering his best friend. In an effort to break the spell, Rogers cuts short his visit with Philip, but after he has left, Philip is drawn back to the museum and finds Rogers' head is on Salome's platter. As the deranged proprietor bars Philip's exit with an axe, Philip realizes that he was the original murderer, not his wife. The house is then leased by widower John Reid (Christopher Lee) and his eight year old daughter (Chloe Franks) and her governess Ann (Nyree Dawn Porter). Reid is cruel to his daughter. When Ann buys her a doll, he throws it into the fire as he is afraid because Jane is too like his evil dead wife. Because of her hatred for her father, evil possesses Jane and she reads about black magic. 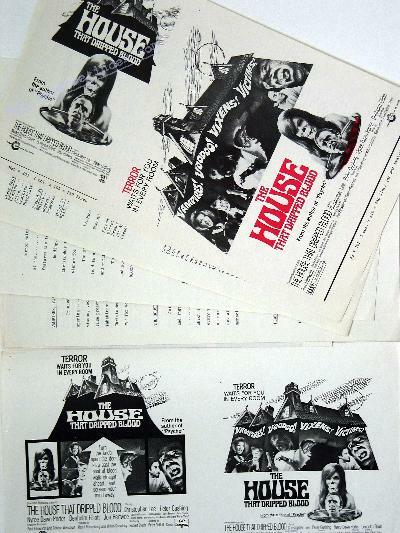 The last person to rent the house is Paul Henderson, star of horror films, and expert on the supernatural. Currently shooting a vampire film, he buys a cloak, from the strange proprietor of a musty old shop for his costume. The cloak has strange effects on him. He bites Carla (Ingrid Pitt) while filming a scene, at midnight he rises from the floor, and he grows fangs. Carla laughs as he tells her of the cloaks effect. She dares him to put it on at midnight, but nothing happens. Paul then learns the terrifying reason for this. Holloway insists on visiting the house and learns for himself the real secret of the house and its inhabitants. First Story ............................... "Method for Murder"
Third Story ............................... "Sweets To The Sweet"
Fourth Story ............................... "The Cloak"